Big Purple Flowers! Rhododendron is a native shrub that grows well in the Hudson Valley. It can be planted in full to shade but prefers part shade conditions (morning sun – afternoon shade). 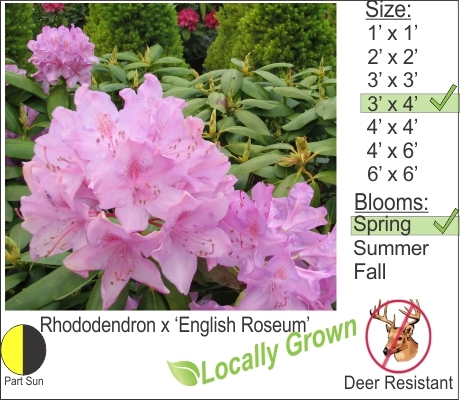 Rhododendron like well drained acidic soils so when planting you will need to include a good amount of peat moss into your existing native soil. During hard winters in high deer populated areas you will probably need to wrap deer netting around this shrub to protect it from grazing.